Independent lubrication and non-independent lubrication can be switched. Reducer drive of pellet mill strengthen with 3 level. Stainless steel Die with high wear resistance and high capacity. This kind of motor of wood pellet machine is frequency and has thick copper coil, motor of wood pellet maker won’t be burned due to instantaneous current. Gearbox shell of wood pellet machine adopts casting with good rigidity, good heat dissipation, Low heat distortion and high stability. Control panel, tablet computer and mobile APP of wood pellet machine can be used to monitor the temperature of critical parts and the electric current of the equipment. 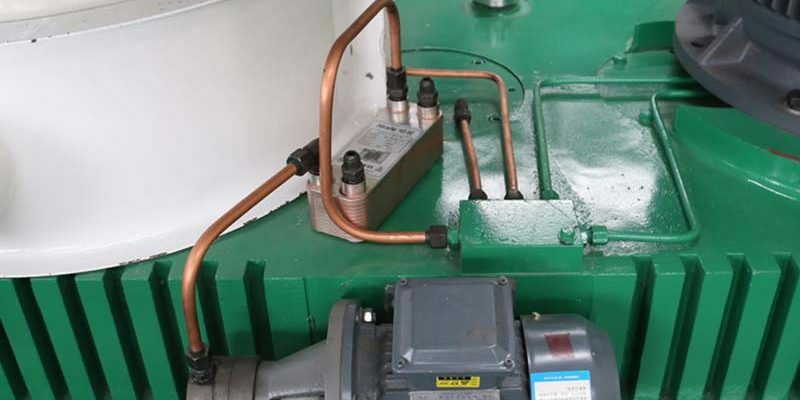 Gearbox Lubricant of biomass pellet machine adopts bypass water cooling system to avoid oil temperature is too high, greatly enhance the internal bearing life.